If you’ve never utilised outsourcing before you might be wondering how it integrates into your firm’s workflow. Outsourcing has an added benefit that you might not have thought of – it can often provide an insight into how organised, or disorganised, your firm actually is. It can be the wake-up call that some firms need to tell them that they need to create a structured workflow, because a structured scenario works much better with outsourcing, especially for larger firms. The way the wake-up call works is that as more and more of the basic work (compliance, bookkeeping, etc.) gets shifted overseas your in-house team is going to be called to upon to provide the necessary info in a more timely fashion. This is a good problem to have because it also means you’re going to have more time to slot in new clients. While smaller or solo firms may do well outsourcing with no special adjustments, as they get larger (and firms that are already at least medium-sized) will probably find it’s to their benefit to assign an administrator. The Principal does an end review and signs off on the file. The Client Relationship Manager interviews the client and liaises with the client for any follow-up information needed by your overseas team. The Client Services Administrator gathers all of the pertinent data, does the initial prep of electronic work papers, prepares the fee proposal, performs the usual related admin duties (photocopying, filing, etc. ), prepares outgoing correspondence to clients regarding Aus or NZ tax requirements, ASIC (lodgements, reporting, updates, form prep and distribution), checks Banklink data going to and from client, and collates all reports that will go to the clients. Boiled down, the Client Services Administrator is the funnel through which all the info is prepped and sent off to your outsourced accountant. The goal is to get as much of the common workload off the plates of the in-house accountants as possible, freeing them to concentrate on higher-end work and client relationships. If you’re wondering what the ratio should be between the latter two positions and your overseas talent, we’d suggest something along the lines of – 1 Senior : 1 Receptionist : 4 outsourced accountants. To maximise your cost benefits ratio we’d suggest that you consider only sending work that would take you over 3 hours to complete on your own. The reason for this is that you do have to do some prep at your end, and smaller jobs will take up so much of your time with prep anyway that it probably won’t be worth it for you. Our overseas workers try to compile all of their queries but we find on average that it takes two rounds of queries to make sure everything is clear. Your best bet of course is to have gathered all the information up front (something you’ll get used to once you settle into working with your overseas team). Make sure that your provider sends mid-job queries in an easily understood and accountable manner. A whole bunch of separate emails is going to make for a messy job. 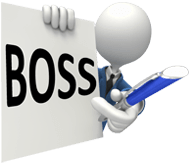 We here at BOSS find that most accounting firms we work with prefer receiving the queries in an Excel spreadsheet. The trick for you is to answer all of the queries before you send the spreadsheet back to your overseas team. Your workflow will flow better if you don’t have to wait until the last minute before your clients get their info in to you. Try to instill a positive early filing habit in them by sending out polite reminder letters in July and December. Better yet, include a checklist on those letters that details the info you need from each particular client. Adding someone to your in-house team who manages workflows (delegates jobs, targets workflow interruptions, sets targets, advises workflow improvements, etc.) will depend on the size of your firm. If you don’t want to hire someone on specifically for the post a Senior Accountant could take up the reins. The goal here is again to keep the desks of the other Senior Accountants and those higher up the ladder as free as possible, allowing them to focus on growing the firm. With the right outsourcing provider communication with your overseas team is actually fairly easy. You’ll be able to set up weekly or monthly review sessions. Keep your outsourced workers in the loop as to any changes you’re making to your procedures. A good accounting outsource provider will give you a way to have direct contact with the accountants doing the actual work, they’re not going to try to throw up hurdles so they can manage the information that gets back to you. As for your end, it’s quite easy. Just have a quick two-minute update conversation with your overseas accountant in the same way you would with an in-house accountant, except that it’s done over Skype. You could also include overseas team members in group meetings in the same manner. Above all else, don’t be shy if you feel there’s a problem. A good provider is going to want to adjust their outsourced accountants to your way of working as much as possible. But they can’t fix a problem if they don’t know that it exists in the first place.